I love using Mozilla Firefox instead of Internet Explorer. It makes me feel warm and fuzzy inside. The caveat with using only Firefox is that some webpages just don’t work, since they require some IE specific “feature” (be it an ActiveX component OR a non-standard rendering bug). Among these pages is Microsoft (Windows) Update and Office Update… we’ve been forced to run these pages from Internet Explorer. If any of you have played around with Netscape 8, you would know about the feature that allows you to switch between the Firefox rendering engine and the Internet Explorer engine. This feature exists specifically to solve our little IE web page problem. I’ve recently found a new Firefox extension that adds this feature for us non-Netscape users. IE Tab allows you to view webpages from Firefox using the IE rendering engine. 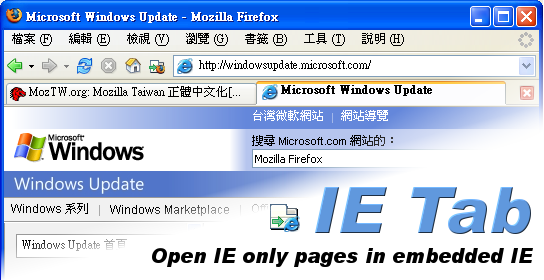 You can even set certain webpages to automatically use the IE engine such as your favourite http://windowsupdate.microsoft.com and http://office.microsoft.com. This extension is also a bonus for us web-developers that have to make sure our designs behave in IE… we don’t have to run Internet Explorer anymore. You are currently browsing the Jeffothy's Keyings blog archives for November, 2005.